If you wish to express your appreciation to your guests, here are some of the best wedding thank you notes that you can use. In this post, you will get to read the most beautiful wedding thank you Messages. You can make these wedding thank you notes more special by personalizing them by writing the name of the guests. 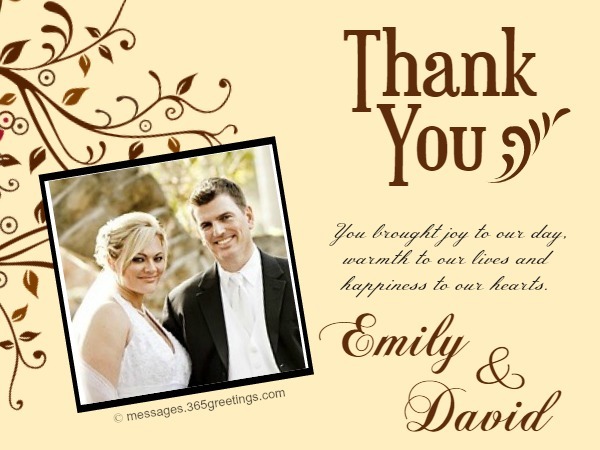 Just scroll down and see our examples of thank you notes for wedding. Keep it sweet and short. NOTE: You may download and edit these wedding thank you cards and add your own names and details on it. Find our free printable wedding thank you cards. Running short of words to write wedding thank you notes wording? No problem! This section of our post has lots of beautiful and sweet wedding thank you notes wording. Feel free to send them to your special guests on your wedding for thanking them for their presence. and with such a lovely present of yours. to have you at our wedding. That’s more than important for us. for coming to our big day out of your busy schedule. It’ll remind us of your humbleness. Your gift means a lit to us. We shall treasure it for our entire life. and thoughtful gifts were a blessing for us. were a treat for us. and will be cherished forever. there at our beautiful moment. to have you all present here at our wedding. and made people laugh with your acts. Thank you for the fireworks. and spread joy and laughter. Thanks for attending my wedding! If someone has brought a gift or a present for you on your wedding, you should really thank them for this thoughtfulness and generosity of theirs. Here are the most beautiful thank you notes for wedding gifts. You can send these thank you notes to all your guests who brought a gift for you on your wedding. and kind words and sharing our special day with all. after you gave us such a hearty gift. Your choice of gift was outstanding. and messages were really awesome. the great human you are. and support were really wonderful. Looking for some sweet thank you notes after wedding? This section of our post has a collection of unique and beautiful thank you notes after wedding. You can send these thank you notes to all the ones who attended your wedding or worked in your wedding to make it special and perfect. -from new Mr. & Mrs.
for being there at our wedding ceremony. beginning day of our married lives. at our wedding and clicking such great pictures. We are really happy to see them. in being there at our wedding. the joy in having you at our wedding. Thanks for the lovely gift too. and spreading joy at our wedding. that we are really overwhelmed. It really made our day so special. for being at our wedding. the day as much as we did. Money gift is amongst the most useful gifts that one can get. You can buy stuff of your choice and need using that money. If someone has given you money as a gift on your wedding, then you should not miss a chance to thank them for this generous and kind act of theirs. Here are the wedding thank you notes for money. You can send these thank you notes for money to everyone who has gifted you money on your wedding. after hefty spends at the wedding ceremony. We loved celebrating our day with you. Thank you for the money gift. Your money gift is much appreciated. but also for the money gift of yours. with your generous money gift. We really hope these beautiful and kind wedding thank you notes will help you in expressing your joy and happiness towards the ones who attended your wedding and gave your gifts. Feel free to send these thank you notes to everyone and anyone who attended your wedding. Do stick around with us for more useful and thoughtful messages and thank you notes for special occasions of your life. Wedding is a amongst the most special events of one’s life. It is not just an event, but it’s an entry to an entire new phase of one’s life. After wedding, life changes forever. There are so many people including friends and relatives, who are present in your wedding ceremony to share that special and joyful moment of your life with you. Therefore, it is very important that you express your sincere gratitude and thanks to all the ones who attended your wedding. Here are some of the prettiest free printable wedding thank you cards. You can download these free printable cards, personalize it by adding personal message, your name, photos etc and send to all the ones who came to attend your wedding. It was lovely having you at our wedding! It was a pleasure having you in our wedding ceremony! Here’s presenting you our second beautiful creation! This is a very elegant and warm wedding thank you card. 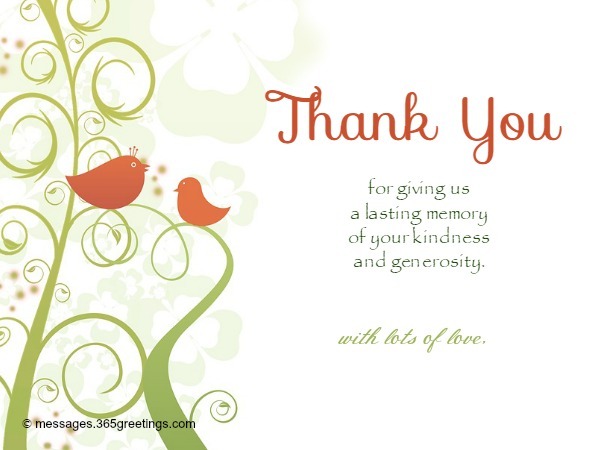 This is a complete card, though there is always a scope of adding your personal message. You only need to add your names in this card and it’s ready to dispatch! You can send this card to your friends, co-workers, clients and relatives too! I loved your presence in my wedding! It was indeed a pleasure, having you in the most special event of my life! I would have felt sad, if you would not have come to my wedding! Your presence doubled my happiness! I loved your surprise visit dear friend! This is our fourth thank you card. Look at the pretty design and beautiful wedding rings! It is making this card look more beautiful and romantic. We have already completed this card by adding a wedding thank you note in the card, you only need to write your names in the card and send it to your near and dear ones. I am pretty sure, who ever is going to receive this card will surely feel happy and special. Look at this fifth thank you card! It is actually a photo card. You can add your favorite wedding portrait to this card, write your names and send it all the guests who were present in your wedding. 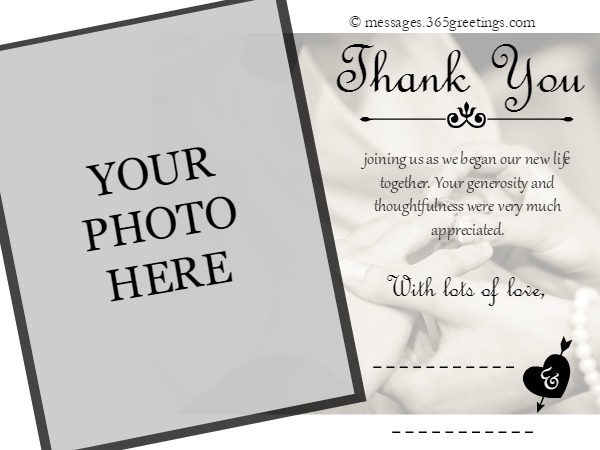 This card already has thank you note in it, so you only need to add your photograph and write names. This photo card has its own charm. When you print and send this to your special guests who were there on your wedding, they will feel really happy on seeing this. Not only this, but they can also use this as your wedding souvenir which shall be cherished forever. Photograph in this photo card can be added easily by using any photo editing software like Picasa or Photoshop. Here’s another beautiful wedding thank you photo card for you. The monochrome design with a wedding ceremony background is making this card look more beautiful. Just like the previous card, you only need to add your best wedding portrait to this card in order to personalize it, along with your names and this card is ready to send. Your presence in my wedding really meant a lot! Thank you so much for being there on my wedding. Wedding is a start of new phase of life. Thank you for coming on this special event! Thank you adding joyful and fun moments to our wedding ceremony! Here comes the eighth card from our designer studio. This is a beautiful retro style wedding thank you card. If you recently had a wedding theme of 80s or retro etc. then this card will be a perfect choice for you. Even if, you did not have a theme wedding, you can choose elegantly beautiful card which looks luxurious and sophisticated. Simply add your names to this card and it’s ready to go! Looking for cute wedding thank you card? I am sure, this card will surely fit your choice. This card already has a beautiful thank you note on it, you can add your names on this card and send to make your guests feel special and happy. This is last yet the most beautiful card from our designer studio. The design of this card is elegant and beautiful. It looks like a hand-painted card. You can print this card on a matte paper which will surely enhance the beauty of this card. If you want, you can write personal messages to this card. 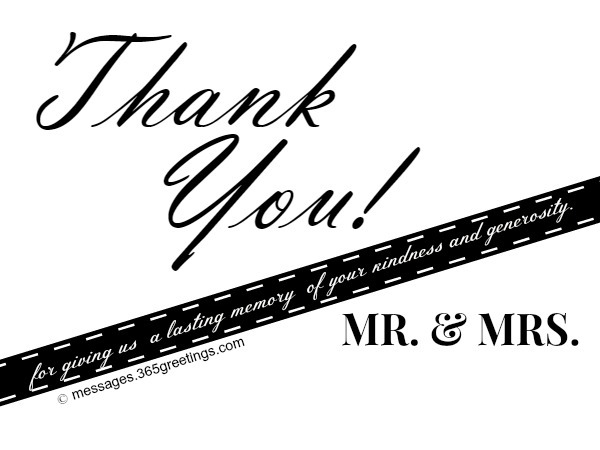 Sample text messages to write on this wedding thank you card are written below. Check them out! Thank you for attending our wedding! for coming to our wedding. and gracing it with your presence! It was a pleasure having you in this special event of my life. You made my wedding more memorable with your presence! Hope you liked these free printable wedding thank you cards. Feel free to use them to express your thankfulness and gratitude towards your guests and relatives who all attended your wedding.